What are the Best Sources of Discount Maternity Clothes? Secondhand stores often have used maternity clothing. In many places, brand new maternity clothing is an expensive commodity. Many people believe that the relatively short time of wear for this clothing does not warrant its high price tag. There are many sources for discount maternity clothes for those who would prefer to go that route. Discount maternity clothes might be obtained from a thrift store, a consignment store, a discount department store, an online auction site or a friend or relative. When people no longer have a use for items such as clothing, furniture, electronics or accessories, they often bring them to a thrift store. 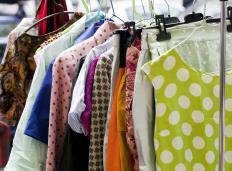 The thrift store then sorts the items and places them for sale on the retail floor. Many times, a portion of the sale of each item goes to a charity. Many women do not have a constant need for their maternity clothing, so they might bring it to a local thrift store, where it is sold for a fraction of the original cost. It is even possible to find items that have never been worn and still have the original store tags on them. Consignment stores are similar to thrift stores in that it is possible to find clothing and other items at discounted prices, but the comparison ends there. These stores handpick the items they would like to sell based on a variety of criteria, such as what stock they are low on or what sells quickly in that particular area. The items are placed on the retail floor for sale, and after an item is sold, a portion of the selling price goes back to the donor. Often, consignment stores feature name brand and quality clothing for a small portion of the original cost, making it a great place to get discount maternity clothes. Discount department stores generally carry a wide variety of merchandise, including maternity clothing. They might have a relatively small selection, but they generally carry most or all of the seasonal items needed at relatively low prices. Discounted maternity clothes might be found as items go on sale or are sold at clearance prices. Online auction sites allow sellers to list their merchandise for sale and allow buyers to bid on or immediately buy the items. Sometimes, items are strictly for bidding only, and sometimes they can be either bid on or bought right away. Many people consider this a great way to purchase discount maternity clothes. When looking for discount maternity clothes, individuals should consult with friends or family members, because they might be a great source for gently used maternity clothes. Many times, these individuals will let an expectant mother have the clothing for free or borrow it for a short time. Some women set up maternity clothing swaps, so they always have different outfits to wear throughout their pregnancy. How do I Choose the Best Petite Maternity Clothes? How do I Choose the Best Maternity Leggings? How do I Market Maternity Photography?